Immediately following the reelection of Iranian President Hassan Rouhani last month, the country’s Oil Ministry began boasting about its expectations that new investment deals with European nations would be signed before Rouhani took the oath for his second term later this summer. There doesn’t appear to be much concrete information to back up these claims, and the Islamic Republic of Iran has a demonstrated track record of exaggerating its own prospects, both in terms of economic outcomes and military development. Yet, the latest rhetoric reflects political and diplomatic realities, including the likelihood of some Western policymakers and businessmen taking Rouhani’s reelection as a cue to expand their relations with the Iranian regime. This is something that the whole world should be alarmed about. When the Iran nuclear agreement, or Joint Comprehensive Plan of Action, was implemented in January 2016, it was not a good time to invest in Iranian institutions or to attempt the normalization of relations with the Islamic Republic. Now that Rouhani has been reelected following his repetition of the same reformist promises that were broken over the past four years, it is still not a good time for investment or normalization. As a matter of fact, there simply is no good time for those moves. The only circumstances under which Western entities should reenter Iran is after the theocratic regime has given way to a democratic system of governance that affords liberty to its people. The U.S. Senate this month approved a sanctions package that would extend terrorism-related restrictions to the entirety of the Iranian Revolutionary Guards Corps – a measure that should have been implemented virtually as soon as the hardline paramilitary came into being. But on the other hand, for all of President Donald Trump’s tough talk on the Iranian regime, he has stopped short of blocking newfound deals like the multi-billion dollar Boeing aircraft sale. In fact, his administration has extended the waivers under the JCPOA, even while emphasizing the fact that Iran remains the world’s foremost state sponsor of terrorism and calling for the international community to isolate Tehran and deny it the means of terror financing. It is arguably understandable that Trump doesn’t want to assume the political risks of unilaterally undermining the JCPOA. But this does not absolve Europe from responsibility if any of its governments or businesses decide to hand money to Iran in the naïve hope that it will not make its way into the hands of terrorist groups or into the accounts of institutions that are responsible for regional destabilization and the violent repression of the Iranian people. It will take serious effort for the world to counterbalance the misplaced sentiments of those who see Rouhani as a realistic prospect for moderation within Iran’s clerical regime. Of course, this moderation did not manifest during his first term in office, when he oversaw the worst period of executions in 25 years, as well as several illicit ballistic missile tests and a more than two-fold increase in close encounters between IRGC attack boats and Western vessels transiting the Persian Gulf, let alone the IRGC’s murderous interventions in Iraq and Syria. In the wake of all this and much more, the vast majority of the Iranian people do not take Rouhani’s renewed promises of reform seriously. As such, neither should European governments or would-be investors. But not everyone in the West is suitably aware of Iranians’ disillusionment, much less their overwhelming readiness to support international efforts that would isolate and economically cripple the regime’s hardline institutions to make way for the democratic transformation of the country. This situation is something that the world community as a whole must understand before individual stakeholders make any decisions that could indirectly finance Iran-backed terrorism. One way of making this situation known is to focus the attention of policymakers and business leaders onto the Iran Freedom rally that will be taking place outside of Paris on July 1. 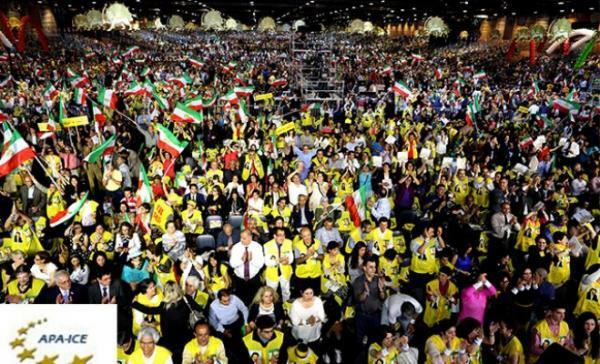 The annual event, organized by the National Council of Resistance of Iran (NCRI), attracts tens of thousands of Iranian expatriates and is viewed by millions of Iranians using illegal satellite dishes inside their home country. I have participated in this event many times. It is well attended by European and American political dignitaries and foreign policy scholars. Virtually every Iranian who participates in the NCRI rally has lost family or close friends to the Iranian regime, generally under circumstances of willful ignorance on the part of Western authorities. Yet they do not resent today’s Western leaders for those losses; rather, they see Western vigilance as a tool that could go a long way toward sparing a new generation of Iranians from suffering the same pain.